Eye, Retina - Dysplasia in a female B6C3F1 mouse from a chronic study. There are focal infoldings or rosette-like formations of the retinal layers (arrow). 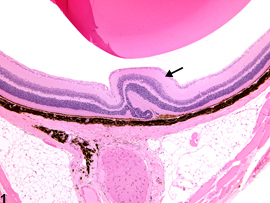 Eye, Retina - Dysplasia in a female B6C3F1 mouse from a chronic study (higher magnification of Figure 1). There is retinal dysplasia (arrow) with little, if any, concurrent degeneration or necrosis. Retinal dysplasia ( Figure 1 and Figure 2 ) is an incidental developmental anomaly occasionally noted in rats and mice. It consists of variably extensive focal infoldings or rosette-like formations of the retinal layers, sometimes with poorly developed or disorganized architecture. There is usually little if any concurrent degeneration or necrosis. Minor cases are of no clinical significance. 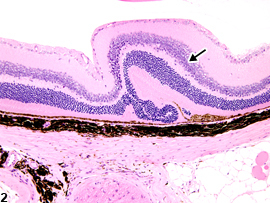 Retinal dysplasia occurs as a heritable genetic defect in some mice, and similar changes have been induced in rat pups by deficiencies of certain nutrients during the fetal period or by perinatal administration of toxins. However, the exact cause of most cases in rats and mice is unknown. Retinal dysplasia should be diagnosed as present (no severity grade assigned). However, severity grades could be assigned if they would help clarify a treatment effect (especially in perinatal exposure studies). Gottschall-Pass KT, Grahn BH, Gorecki DKJ, Paterson PG. 1997. Oscillatory potentials and light microscopic changes demonstrate an interaction between zinc and taurine in the developing rat retina. J Nutr 127:1206-1213. Haider NB, Naggart JK, Nishina PM. 2001. Excess cone cell proliferation due to lack of a functional NR2E3 causes retinal dysplasia in rd7/rd7 mice. Hum Mol Gen 10:1619-1626. Poulson R, Hayes B. 1988. Congenital retinal folds in Sheffield-Wistar rats. Graefes Arch Clin Exp Ophthalmol 226:31-33.